So I’ve updated the initial planting this year to 264 new plants from seed. I’m spending my free time trying to get everything stocked up for the warmer weather. Cabbage, watermelon, and greens end up on top. Yesterday, Jen posted on getting the most bang for your buck in the produce section. By comparing the price-per-cup of various fruits and vegetables to their ANDI score, she arrived at a rough ranking of the best, cheapest sources to get your vitamins. She didn’t have time to track down the whole list, but I did. Jen already highlighted the smart choices: cabbage, leafy greens, carrots, and cauliflower for veggies, and watermelon, plums, oranges, and apples for fruit. What shouldn’t you waste your money on? I wasn’t surprised to see corn on the bottom—fresh corn is often expensive and it’s starch-laden interior lacks much in the way of nutrients. Green beans, winter squash, and artichokes all ended up at the bottom, too. Potatoes didn’t rank as badly as I expected, but that’s just because they’re so darn cheap. For fruit, grapes came in dead last—not shocking since they’re largely water. The most expensive fruit, raspberries, came in third, and despite being cheap nectarines landed in fifth. For the most part, it’s all pretty intuitive. The things Mom always tried to get us to eat—like greens and brussels sprouts—look pretty good. But let’s be honest: if you’re fretting the choice between broccoli and okra—and not between Cap’n Crunch and SpaghettiO’s—you’re already way ahead of the curve. Cabbage photo by Sightline staffer Migee Han. While looking for local (inside Florida) vendors, stumbled upon www.tomatogrowers.com website. These guys focus on Tomato, Peppers, and Eggplants. I loaded up on some nice looking options for peppers for this season’s growing! I’m excited, both for some tasty peppers, as well as some fantastic pictures to come..
Photo Credit: katmere via Flickr Creative Commons Attribution License. A perfectly ripe, juicy tomato, still warm from the sun. Sweet carrots, pulled from the garden minutes (or even seconds!) before they’re eaten. Growing your own vegetables is one of those activities that balances practicality and indulgence. In addition to the convenience of having the fixings for a salad or light supper right outside your door (or on your windowsill), when you grow your own vegetables, you’re getting the most nutritional bang for your buck as well. Vegetables start losing nutrients as soon as they’re harvested, and quality diminishes as sugars are turned into starches. For the tastiest veggies with the best nutrition, try growing a few of these nutrient-dense foods in your own garden. And don’t let the lack of a yard stop you – all of them can be grown in containers as well. Photo Credits (left to right): Wanko, Qfamily, George Scholz, via Flickr Creative Commons Attribution License. Photo Credits (left to right): norwichnuts, photon, S. Diddy, via Flickr Creative Commons Attribution License. Photo Credits (left to right): La Grande Farmer’s Market, SummerTomato, color line, via Flickr Creative Commons Attribution License. Photo Credits (left to right): Oakley Originals, djprybyl, djprybyl, via Flickr Creative Commons Attribution License. Looks like the blueberries are blooming! 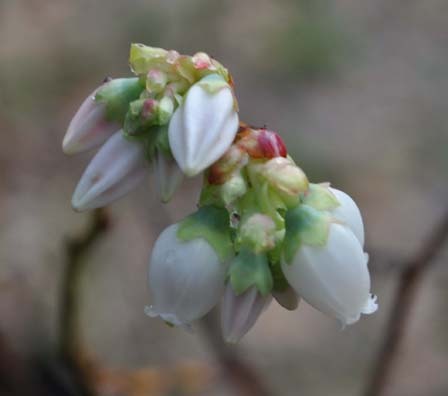 Came home today and noticed that the blueberry plants have started blooming.